Patriotic Assembly Song of the Week "This Is My Country"
Alan Menken is an American pianist and composer for films and musical theatre. As a boy, Menken dreamed of becoming a singer and songwriter when he grew up. He figured he'd end up being a dentist like all the other men in his family. But like Walt Disney, Alan Menken made his dream come true. Menken is best known for the music he wrote for films produced in the 1990’s by ﻿Walt Disney Animation Studios. 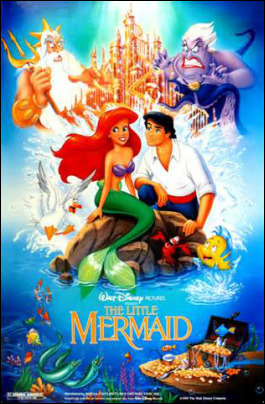 ﻿His first animated musical with Disney was ﻿The Little Mermaid, released in 1989. The Little Mermaid brought Menken two Academy Awards. It was the first major successful film Disney Studios had produced in a while, and the one that made Alan Menken's career. The Best Original Song was "Under the Sea", written in a calypso style. Calypso music originated in Trinidad, in the Caribbean Islands, where the mermaid Ariel lives. Calypso music also features steel drums, which can play both rhythm and melody. In the film, seashells were used for drums Menken's tropical sounding music helped to set the scene and make the film believable. Pitch letters are placed on the drum. Striking different areas on the drum produces different pitches. After writing the music for The Little Mermaid, ﻿Alan Menken composed for Disney films for two decades. ﻿He holds second place for Academy Awards won for music. ﻿The Little Mermaid, Beauty and the Beast, Aladdin﻿, and﻿ Pocahontas﻿ have each won him two ﻿Academy Awards﻿. He also wrote the music scores for The Hunchback of Notre Dame, Hercules, The Shaggy Dog, ﻿Home on the Range,﻿ and Tangled. The Little Mermaid is different from previous Disney fairytales in several ways. The characters are more realistic in their personalities. Ariel and King Triton face the same problems of any father with a 16-year old daughter eager to grow up. This film is also different because it has something the earlier Disney fairytales didn’t have – an “I want” song. The lyricist, Howard Ashman, called Ariel’s theme song, “Part of Your World”, an "I Want" song. It describes in detail Ariel's desire to become part of the human world and culture. The song is an expression of longing sung in a Broadway musical style. In writing this song, Menken and Ashman understood that to make characters believable, an audience must be able to connect emotionally with them. Frameworks: M.4.4., M.5.4., M.5.5., M.5.6. Newsies. Enchanted combines live-action characters with animation. Newsies is a musical drama film produced by Walt Disney Pictures. It is loosely based on the New York City Newsboys Strike of 1899 and features original songs by Menken. Newsies The Musical is a Disney Theatrical Productions stage musical based on the 1992 film. In musicals, a character’s thoughts and feelings are expressed through solo or duet songs. But the choruses can be the most exciting parts of a musical. Choruses are when a large group of actors are engaged in singing. There is usually a choreographed dance scene with it. The purpose of chorus songs is to help move the story along, comment on actions in the drama, and provide information to the audience. In Newsies, the song “Seize the Day is a chorus number where newspaper boys in New York City join forces to go on strike for better wages and individual rights.The excitement they experience at this decision is translated through the singing, dancing and acrobatics found in this scene. A men's chorus sings "Seize the Day". Walt Disney’s 33rd animated film was Pocahontas. Pocahontas is the first Disney animated film to be based on a real historic character, known history, and the folklore and legend that surrounds the Native American woman Pocahontas. It tells of her encounter with Englishman John Smith and the settlers that arrived from the Virginia Company in 1607. The film’s theme song is “Colors of the Wind”, recorded by singer Vanessa Williams. It is a pop ballad, which is a narrative set to music and an emotional love song. (See the lesson below on form to learn more about ballads.) The lyrics speak of Pocahontas’ love of the earth, respecting nature, and living in harmony with the earth’s creatures. “Colors of the Wind” poetically presents the Native American viewpoint that the earth is a living entity where humankind is connected to everything in nature. The lyrics reflect Native American culture by using imagery, such as “the voices of the mountains”, and “painting with the colors of the wind”. There is an unusual phrase which tells of the wolf crying to the “blue corn moon”. This phrase has no real meaning in Native American folklore. It was made up by lyricist Stephen Schwartz because he liked the sound of it. "Colors of the Wind" won an Academy Award for Best Original Song, becoming Menken's fourth win in that category, and a Grammy Award for Best Song Written for a Movie. The best successes contain important life lessons for us to learn.This song teaches us to accept humans who are different in appearance and culture, and to learn from them. One of the elements of music is called form. This refers to the way songs are constructed. Ballads are in the form called AABA. Each section of the music is labeled with a capital letter. The A sections have the same music. The B section is different music. In pop songs, the B section is often referred to as the Bridge because it creates a contrasting link between the A sections. As you watch the song video, listen for the repeating A sections and the contrasting bridge section. One element that we can always expect from a Disney musical is spectacle, and our last Disney song for this week is a spectacular musical number from the 2007 film Enchanted, with music composed by Alan Menken and lyrics by Stephen Schwartz. Enchanted is like a combination of Cinderella and Snow White and the Seven Dwarfs. The song “That’s How You Know (When You’re In Love)” is performed by the film's lead actress, Amy Adams, and features vocals and other singers in the background chorus. Like the film, the song was written to both honor and mimic past Disney works, specifically big production numbers like "Under the Sea" from The Little Mermaid and "Be Our Guest" from Beauty and the Beast. In the film, the upbeat song is performed by Giselle as she walks through New York City’s Central Park with her friend, Robert. She spontaneously starts to sing in order to explain to him how he should show his affection for his girlfriend. As Giselle sings and dances through the park, she is joined by other people in the park including a Jamaican steel band, elderly dancers, Bavarian dancers, roller bladers, and buskers. Buskers are various types of street entertainers. While the song only lasts about four minutes, there is a lot packed into the scene. Keep in mind that in filming a spectacular scene like this one, all the singing is actually done in a recording studio then added to the film. It takes a lot of teamwork to create the entertainment that Disney Studios provides us, and Alan Menken has been an important part of that team for two decades. Just think, what would Disney films be like without the music and songs to enhance them?